The clear chilly waters of the Gulf of Maine, as uninviting as they might seem to land-huddled humans, are perfect for seaweed. High tides, little heavy industry and thousands of miles of craggy coastline make it one of the best spots in the world for seaweeds. So much so that 250 varieties thrive there. When you add to that the rapidly growing market for seaweed around the world, you have a small industry bursting to expand in a region hungry for jobs. The catch here is that only a certain amount of wild, hand-harvested seaweed can be pulled from the Gulf’s waters without affecting the sustainability, or rejuvenation of the crop. 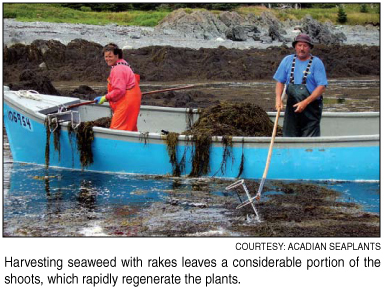 And the limits of some of those harvests are already approaching, said Shep Erhart, owner of Maine Coast Sea Vegetables in Franklin, Maine, and an early pioneer of seaweed farming in the Gulf. “We’re reaching the upper limit of the sustainable harvest for at least three of our species.” Meanwhile, demand for their products is growing at 10 to 15 percent a year, he said. As fish farms move farther offshore and into deeper waters, monitoring the environment around them poses bigger challenges. 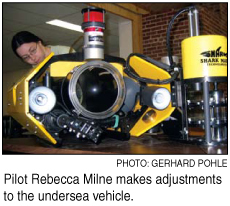 A multi-partner project led by the Huntsman Marine Science Centre (HMSC), St. Andrews, New Brunswick, is evaluating the use of remotely operated vehicles, or ROVs, for aquaculture in general and sediment analysis in particular. While the HMSC sees a number of potential uses for ROVs in research and education, this particular project focuses on environmental monitoring of aquaculture. Aquaculture today involves the farming of diverse organisms including fish, molluscs, crustaceans and aquatic plants. It is the fastest growing food production sector in the world. Consumers, regulators and public interest groups concerned about the environmental impacts of fish culture operations are increasingly challenging fish farmers. As a result, regulatory agencies have developed monitoring programs to address the environmental concerns raised by the discharge of organic waste into the surrounding water body. The Gulf of Maine herring fishery is coming under scrutiny this year. Last fall, the Herring Alliance—a coalition of environmental groups and some fishermen—ran a campaign urging New England residents to voice their concerns about the fishery, such as fishing practices, to bolster support for making it a priority fish to protect. As a result, the New England Fisheries Management Council (NEFMC) received some 8,000 public comments by email. In November 2007, the NEFMC voted to reexamine herring regulation, adding the species to its 2008 management priority list. “The council made an important decision today to fix the Atlantic herring fishery,” Baker said in a statement issued immediately after the NEFMC vote. Yet not everyone agrees the fishery is broken.